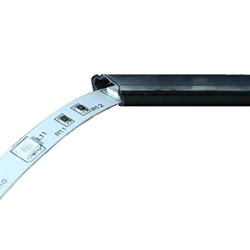 45 degree PVC extrusion for HTPR and SCR3 series ribbon lights. 5 ft long with 2 endcaps. One endcap has hole for wire, one endcap without hole. Can be adhered in place with CYRON 3M VHB tape (part# TP5952-417) or any other two sided tape. Can also be glued in place for a more permanent installation. One piece construction with black body and clear lens.